Jordan Charles Vogt-Roberts (born September 22, 1984) is an American film and television director. His feature directorial debut, The Kings of Summer, screened at the 2013 Sundance Film Festival. The film also won the Narrative Feature Audience Award at the 2013 Dallas International Film Festival. In 2017, Vogt-Roberts directed the MonsterVerse film Kong: Skull Island. Vogt-Roberts started his career producing and directing episodes of two web series, Memoirs of a Manchild (2009-2010) and Book Club (2009-2013), and directing most episodes of the web series Single Dads (2009-2011). After turning an episode of Memoirs of a Manchild into the short film Mint in a Box (2009), in 2010, he wrote and directed the short film Successful Alcoholics. The film screened at the Sundance Film Festival, the SXSW Film Festival, the AFI Fest and 30 other film festivals. Vogt-Roberts went on to direct Comedy Central's Mash Up, as well as episodes of Funny or Die Presents, MTV's Death Valley and FX's You're the Worst. Vogt-Roberts's feature film debut, The Kings of Summer, was screened at the Sundance Film Festival and the Cleveland International Film Festival, and won the Narrative Feature Audience Award at the 2013 Dallas International Film Festival. He went on to direct Kong: Skull Island in 2017, which grossed over $565 million at the global box office. Vogt-Roberts is directing a film based on the Metal Gear series for Sony Pictures. In interviews, Vogt-Roberts repeatedly expressed his passion for video games, and recounted his meeting with Metal Gear creator Hideo Kojima to discuss the making of the film. In Kong: Skull Island, a boat bears the name Gray Fox as an homage to the character of the same name in the Metal Gear series. Vogt-Roberts was born in the United States and grew up in Detroit. On September 11, 2017, Vogt-Roberts was brutally attacked while living as an ex-pat in Ho Chi Minh City. After investigating the case with GQ journalist Max Marshall, Vogt-Roberts identified his attackers and one of the assailants was eventually arrested in India. ^ Mash Up profile Archived 2013-06-08 at the Wayback Machine, comedycentral.com; accessed January 11, 2014. ^ a b "Jordan Vogt-Roberts | TV Guide". TVGuide.com. Retrieved 2019-01-16. ^ "The Kings of Summer: Sundance Review". The Hollywood Reporter. Retrieved 2019-01-16. ^ "Dallas International Film Festival Announces Full 2013 Lineup". D Magazine. 2013-03-12. Retrieved 2019-01-16. ^ "Kong: Skull Island (2017) - Box Office Mojo". www.boxofficemojo.com. Retrieved 2019-01-16. ^ Fleming Jr, Mike (June 3, 2014). "Sony In Talks With Jordan Vogt-Roberts To Helm 'Metal Gear Solid'". Deadline Hollywood. Retrieved May 18, 2017. ^ Weber, Rachel (May 9, 2017). "'Kong: Skull Island' Director Jordan Vogt-Roberts on Kojima and Making the 'Metal Gear' Movie". Glixel. Retrieved May 18, 2017. ^ Skrebels, Joe (March 7, 2017). "Metal Gear Movie Director on the Characters He Wants to Include". IGN. Retrieved May 18, 2017. ^ "Greetings From Hollywood". Retrieved 2019-01-16. ^ Marshall, Max (July 9, 2018). "Attack on Skull Island". GQ. Retrieved July 14, 2018. 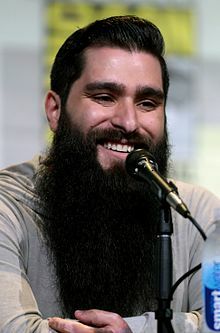 Wikimedia Commons has media related to Jordan Vogt-Roberts.